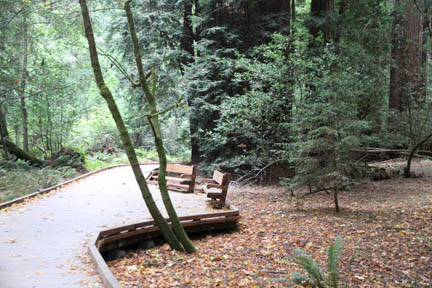 I visited Muir woods this afternoon, driving there by motorcycle from a campground in Olema, California. The last ten miles up to the woods was more adventure than I'd anticipated: up and up an windy road along the Pacific Coast with the right wheel of my Spyder closer than I liked the perilous cliff just to the right. And there were those cars behind me wanting to go faster than I did. Drive a mile, pull off on the narrow shoulder, and don't look down as the cars whizzed by. Then I pulled off Highway 1 onto another windy steep road, but at least this one led up into the forest -- no more cliffs. And soon I was at Muir Woods. 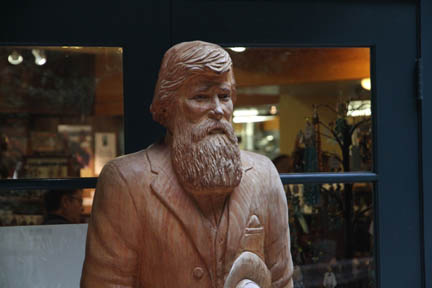 John Muir speaks of nature soothing our troubled spirits -- I'll tell you, after that ride I was ready for some soothing! 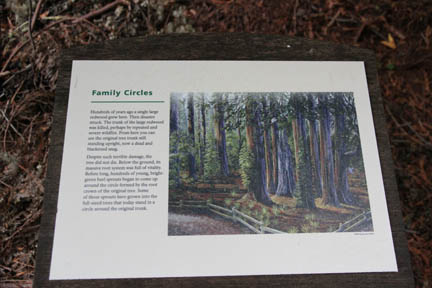 As I walked through the forest I was looking for examples of the kind of lessons we've learned in class about the parks from studying their history. First, this is a National Monument -- so that is the first "lesson," an opportunity to review something we've learned in class. (1) What is a national monument? (2) When were they first created? (3) Why were they so appealing to President Theodore Roosevelt? (4) What was the very first national monument? 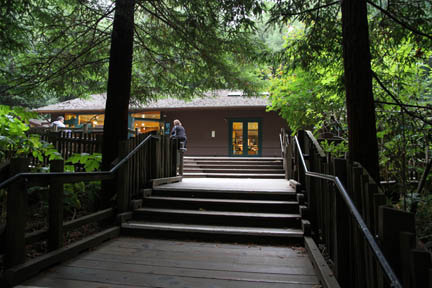 (5) Muir Woods became a national monument in 1908. Who was the president of the United States at that time? OK, on into the park. I liked the sign you'll see below. 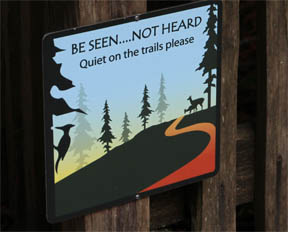 I had seen a similar sign this past summer at the Gettysburg National Military Park, asking silence out of respect for the soldiers who died there during the Civil War. 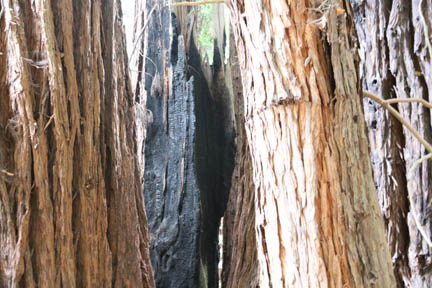 What kinds of associations can you think of for a sign requesting silence in the presence of giant redwoods? And how about this sign, below. We've been learning that in the early days of the parks it was hard to protect the buffalo from extermination or to keep tourists from pouring soap in the geysers. 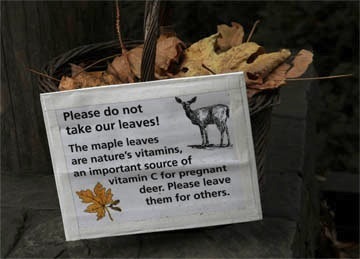 We've grown a lot more sensitive about "leaving it alone" in the natural world, and also a lot more knowledgeable about how one part of the natural world (in this case, leaves) nurtures another part (in this case, pregnant deer). I assume that park employees picked up these leaves from the forest floor - and will put them back! It looked to me like a magical shop in a fairy tale! And it certainly blended into the forest. 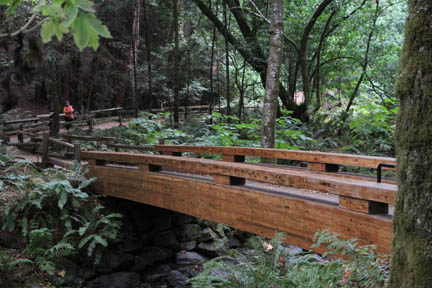 This bridge in the Muir Woods is another example of park-friendly architecture. The wooden walkways through the forest also blended in. That's the old burned tree in the middle with it's "progeny" growing right beside it --John Muir might say, as if to comfort the fallen patriarch!